This was a project tracing important historical moments hidden in otherwise common materials and symbols. Starting from searching for possible connotations of a household object, it was a process to contextualize seemingly random signs for a micro narrative that adapted broader socio-political discourse into the relevance for individuals. Both visual and textual analysis was crucial in identifying adequate symbols and materials in the most appropriate presentation for creative interpretation, however not losing its ground of facts and informative elements. With its precise fabrication, all the movements and effects (including sound) were carefully calibrated for a contemplative experience, which is equally important. Drawing from the artist’s personal recollection, the Japanese-made Brother sewing machine, model DB2-B755-3, once most popular machine during the golden age of the Hong Kong garment industry in the 1960s and 70s, was the most expensive possession of his family that allowed his mother working at home for additional earning while looking after her children. 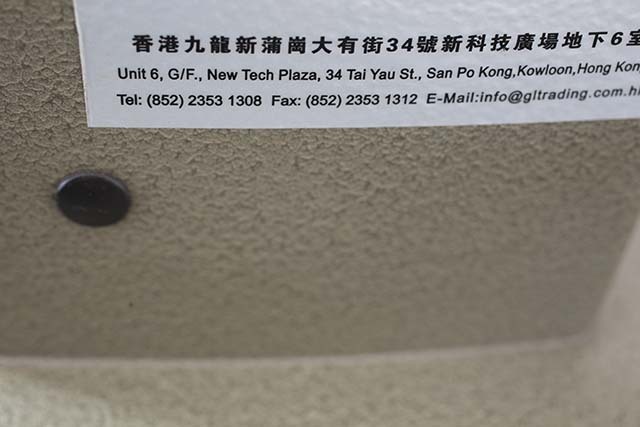 The artist’s father also sewed with a machine of the same model in a large garment factory in Tai Yau Street in Kowloon, where next to it, an artificial flower factory was the site for the beginning of a series of anti-colonial riots in 1967. However, the only told memory of his father about the riots was nothing spectacular, simply commuting between home and work on foot for hours owing to the strike of the bus drivers. 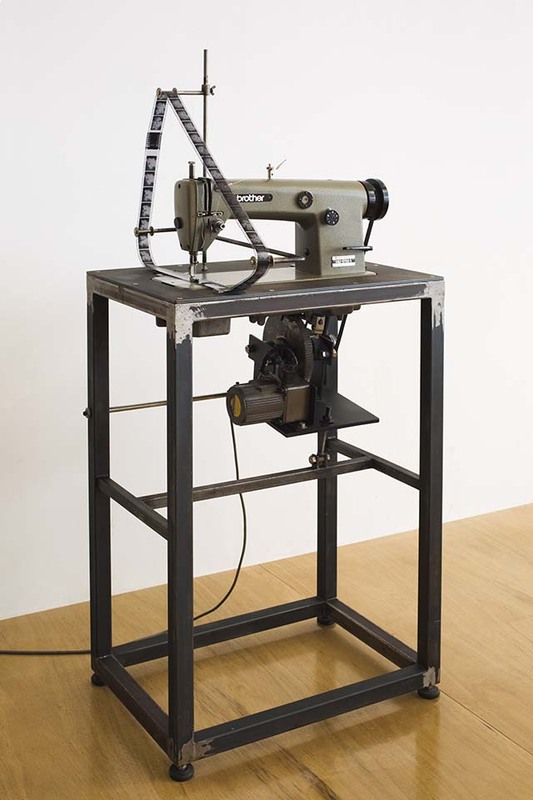 For this sculptural installation, a used sewing machine of the same model, found in a second handed sewing machine shop in Tai Yau Street, was manipulated such that the power punching stroke has been slowed down to one stroke per minute. 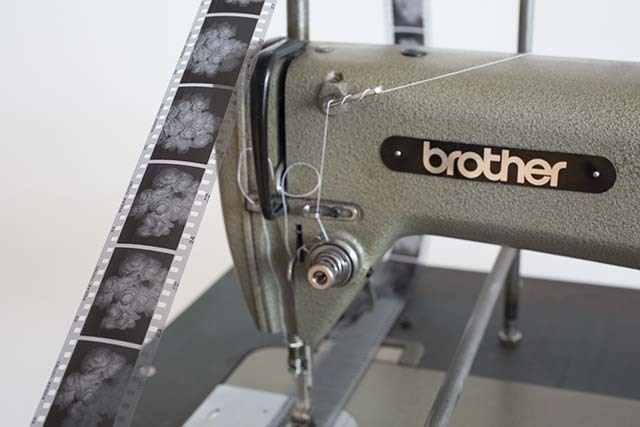 Instead of sewing fabric, the machine pierced a track of holes on a roll of exposed and developed black and white negative film in very slow motion. 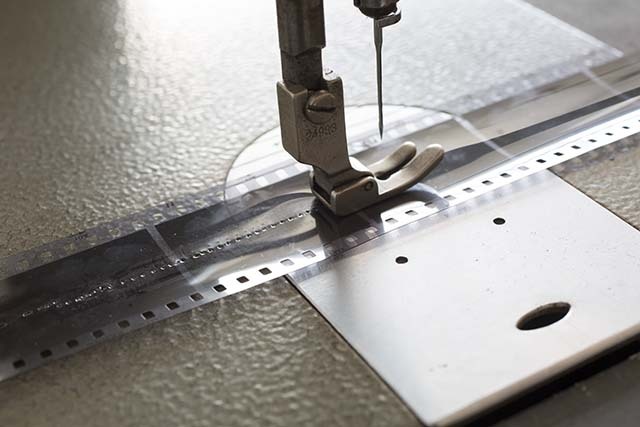 One cycle of this pierced film ran about 10 hours, the usual length of a workday spent by the artist’s father in the factory. A rack of spools was made of 1967 Hong Kong 50-cent coins to guide the film running. 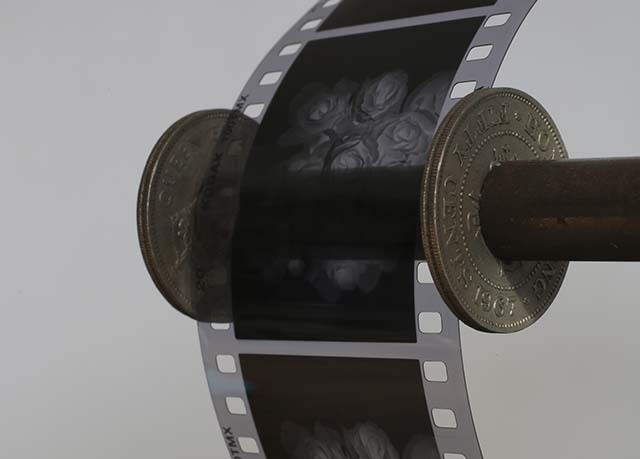 The negative film had captured images of artificial roses and was scanned at different stages in the installation. A series of photographic prints were made as parallel artistic production Untitled (Roses). 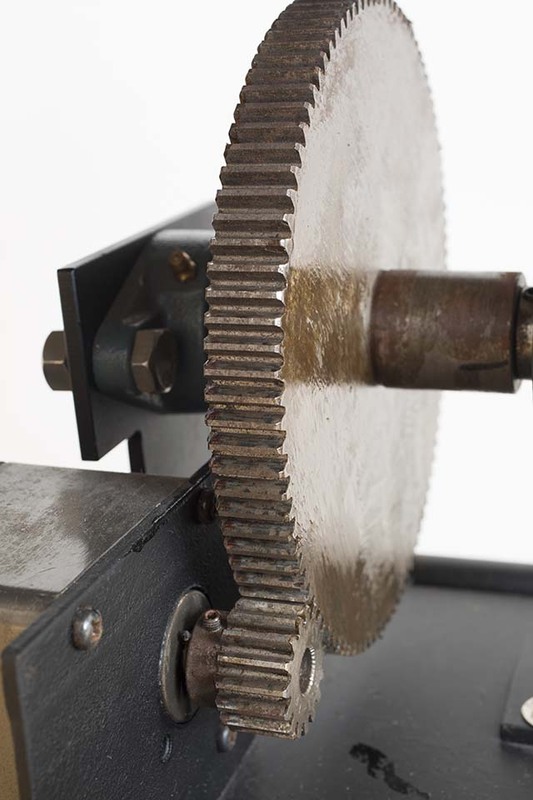 Large gear wheel used with slow-speed motor to maintain the rate 1 stroke/minute.